“How are you?” “Fine” “How was your day?” “Fine.” This is how Every Thing will be Fine begins. And it moves at a slow pace, omitting critical information (like who the characters are) for most of the film. It is only in the last 20 minutes or so the viewer knows who people are and the story starts fitting together. It’s divided up into three segments separated by years of time, and in each section Tomas is with a different woman. It’s up to you to figure out the connections, and we never learn how they take place, except for the second one. The story begins with a scene of Tomas (Franco), a writer, scribbling on a pad when he awakens. He emerges from a hut on a landscape blanketed with snow, chats with a small group outside briefly, letting you know he is not entirely satisfied with his progress, bums a cigarette, gets in his car and takes off. When Sara (McAdams) calls on the phone, he appears unsettled and lights his cigarette. In a flash, a sled with two boys comes sliding down a hill in front of the car. He realizes he has hit something, but reacts slowly, and this is another scene in which it’s difficult to figure out what has happened. Nothing is shown of the boy under the car, and when Tomas comes around to the front, he sees a tiny figure sitting on the ground. Tomas talks gently with him, reassuring him that everything will be OK and carries him on his shoulders up to the house to his mother, Kate (Gainsbourg). We don’t hear much of what is said, but she screams and runs to the car. The police show up, question Tomas, and reassure him it was an accident and he need not feel guilty. Tomas cannot take that advice, apparently, because that and his dissolving relationship with Sara spirals him down into destructive behavior. We get glimpses of that, his conflicted relationship with an aging father, and strange periodic meetings with Kate, to whom he apologizes over and over and says that if there is ever anything he can do to call on him. Kate’s grief is better shown in the film. She sobs, goes to church, and tends to her son Christopher. Tomas, on the other hand, becomes even more reticent, not even telling Sara what happened at first. Every Thing will be Fine, directed by Wim Wenders with a script written by Bjorn Olaf Johannessen, has a number of problems, some of which are mentioned above. The segment on Tomas’ father seems like a needless digression. And I find it hard to believe that a parent would allow her children to slide down a trail that ends up on the road. But the main problem is the lack of explanatory transitions between the three women in Tomas’ life. Franco pulls off the successful, made-it older man just as well as the troubled younger man. Perhaps they are really intended to mark the progress of Tomas’ psychological status. In the first, with Sara, he is majorly depressed even before he hits the children because of writer’s bloc and his relationship being in trouble. Sara is shown to be very attentive to him, so it’s not entirely clear why he leaves her (and we find out it was he who left). In the time period with Kate, he is recovering from self-destructive behaviors, and is attentive to her when she calls him to come over late at night. He feels awkward, but allows her to put a pillow on his lap and go to sleep, and then departs early in the morning. (They wanted to make sure Christopher did not awaken and see him there. It’s not clear why.) It’s also unclear whether they develop a relationship or not. Several years transpire, and suddenly. Tomas is picking up a little girl from school, and they obviously have a close connection. Turns out she is the daughter of his current love, Ann (Croze). In this section, he has become successful in his writing, seems well put together and calm, and is clearly devoted to Mina. What the film does do well is its demonstration that grief and guilt following the death of a child have a radiating effect on the immediate family, on the one responsible and on his relationships. Another interesting phenomenon is Christopher’s almost instant transference toward Tomas during the brief interval when he carries him to the house. Subsequently, Christopher will draw a picture of that, will read all of Tomas’ published novels, and eventually want to connect with him. We see no father around, which may also help explain his being drawn to Tomas. The scenes of how Tomas deals with Christopher’s attachment to him much later on are some of the best in the film. It shows Tomas as having made significant progress psychologically. I’m unsure about where to place the responsibility for the drawbacks of Every Thing will be Fine; certainly much of it has to do with the script, its obfuscation and excruciating pace. But certainly these tasks are also under the purview of director Wenders and the editor (Toni Froschammer). On the other hand, the actors live up to their reputations. 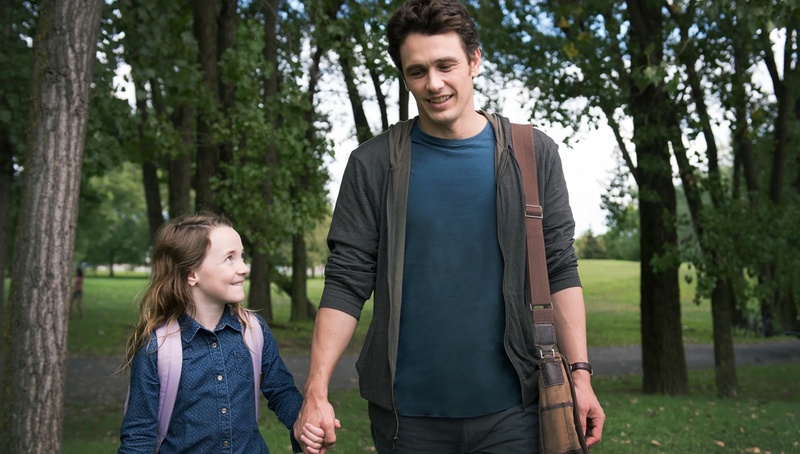 Franco pulls off the successful, made-it older man just as well as the troubled younger man. McAdams is only on screen for brief segments, but she is also good at portraying a supportive, concerned partner as well as an enraged rejected one years later. Gainsbourg’s forté is her ability to portray odd, mysterious characters whom the viewer always remembers. Last but not least, Alexandre Desplat’s music enhances the film throughout, as you would expect it would. Everyhing will be fine, but it’s a long slog getting there.